Home / Winger News / Posts / Awards / RAM TRUCKS SMASH UTE PARADE RECORD – JUST NOT WHERE YOU MIGHT EXPECT IT…..
RAM TRUCKS SMASH UTE PARADE RECORD – JUST NOT WHERE YOU MIGHT EXPECT IT…..
Until Saturday the 5th November 2016, the world record for the largest gathering of pick-up trucks and Utes happened much as where you would have expected it, in Saltillo, Coahuila, Mexico, on 12 July 2015 according to the Guinness Book of World Records, with 638 vehicles. But standby for that record to be re-written with RAM Trucks, not just with the largest parade of pickup trucks, but they were all one make, RAM Trucks, like those now available in New Zealand from RAM dealers across the country. A total 1152 RAMs are set to smash that Mexican record when it’s officially verified by the Guinness Book of World Records. A total 1152 RAMs are set to smash that Mexican record when it’s officially verified by the Guinness Book of World Records. So, where did this record-smashing gathering of RAMs, the epitome of a big American Truck, take place? Texas, surely where there are as many trucks as cattle, or under the blazing sun in Arizona, perhaps in the wide open spaces of Wyoming or even in the vast open prairies of Canada? Nope. Germany. On the top of a mountain. In the rain, on the legendary Nürburgring race track. 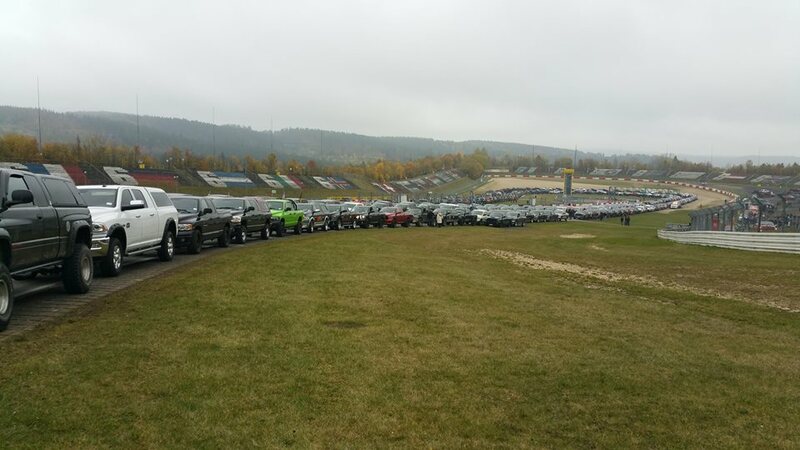 Well over 1100 RAM owners from across Europe gathered at what Sir Jackie Stewart famously called the ‘Green Hell’, where Fangio drove what is often called the greatest F1 race of all time, to set rather different record. It may be a little while before there can be a Kiwi challenge to this RAM-Record, but RAM Trucks are now available from RAM dealers across the country. With the RAM Truck range opening in New Zealand with the 2500 Laramie with a recommended retail price of $163,000 plus on-road costs and the 3500 Laramie has a recommended retail price of $169,500 plus on-road costs. RAM Trucks are backed by a comprehensive three year/100,000 km warranty with roadside assistance. RAM Trucks are backed by a comprehensive three year/100,000 km warranty with roadside assistance. Standard equipment highlights include luxuries such as heated and ventilated front seats that are 10 way power operated for the driver and six-way for the front passenger. All seats are leather trimmed; as well as 12 volt power outlets, there is a 240 volt 100 amp mains power socket; the ventilation system is climate control dual zone; the steering wheel is heated; the pedals are power adjustable; a sun roof is standard; the audio system has nine speakers and a sub-woofer and the dashboard includes a vehicle information system, while there are two rear cameras, one for the cargo area and another for reversing which display on the 20 cm touch screen display.